The White House has been engulfed by the shadow of a mysterious ship. Days go by, and the aliens known as the Visitors make no contact, until one day, they leave. Suddenly the Earth goes still. Billions of people disappear at once. There’s no trace as to where that vast population has gone. Seventeen-year-old Charlie Freeman and his cousin Alex, are two of the few left behind. While fighting for survival they join a girl named Sarah on her journey to Washington D.C. to rescue her little brother. The path they walk is riddled with the horrors, and strange creatures known as Grimms, who lurk in the shadows, killing all those who were left behind. 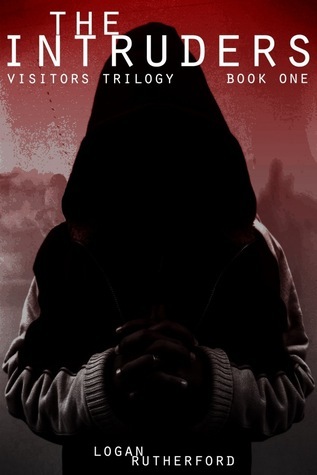 The Intruders is the first book in the Visitors Trilogy, and is approximately 55,500 words. The book has been professionally edited and proofread for you reading pleasure. It is a Young Adult, Action Adventure, Apocalyptic novel, and contains violence, mild language, and frightening scenes. Reader discretion is advised. You can buy it on Amazon HERE for the low, low price of 2.99! That’s cheaper than a cup of Joe! Please share on Facebook, and tell people on Twitter about the book! I’d love you, like, forever! Also, like me on Facebook for news related to book two in the Visitors Trilogy. The title for the book is revealed at the end of The Intruders , but I’m not going to spoil it here. Win a Paperback Copy of The Intruders! That’s right! You can win a FREE Paperback copy of The Intruders! What do you have to do? All you have to do is click the enter to win button below, sign-up for Goodreads if you aren’t already (add me as a friend!) and then wait to see if you win! The contest ends on April 15. Also, add The Intruders to your t0-read list! One last thing: on the page for The Intruders, it says that it is going to be released on April 10. However, that is not true. I had to set a date in order to list a giveaway, so I just said that one. I’ll have an official release date once I get the book back from my editor, who just started editing today. Giveaway ends April 15, 2012. The Intruders First Draft: Done. You guys have no idea how long I’ve been waiting to tell you this. Just twenty minutes ago, I typed the final words of The Intruders. This is one of the greatest moments of my life. I’ve been working on this novel since last August, and the current draft since November. There’s been a lot of bumps in the road, but I’ve finally reached the end. It it’s so freaking satisfying. Yes, it’s kinda short. But I told the story that I wanted to be told, and I’m not going to add a bunch more words for words sake. I’m going to go through and editing it, so the word count should grow larger, but not by much. The sequels are going to be longer, though. Especially book three, which I’ve actually foreshadowed events that take place in book three, in The Intruders. Anyways, just thought I’d let you guys know! I’m hoping to have it to my editor by Friday, and to my beta readers sometime next week. So, the book should be out by the end of March, but most likely the very beginning of April. I’ll have a solid date soon. I’m revealing the cover for The Intruders today! Originally, I was going to have a professional do the cover. Then, I added everything up, and I was going to end up having to choose between hiring an editor, or a cover artist. So, of course, I chose to have and editor. So today, I’ve been messing around with different covers, and this one is my favorite. It looks professional, and it’s the best I’ve ever done. I’m really proud of it. Anyways, enough of my blabbing. Here’s the cover! So tell me, what do you think about it? As I said earlier, I love it. I’m going to finish the book by next Friday, so after that, all that’s left is editing, sending it to the betas (if you want to be a beta, just email me), and then it’s publishing time! It’ll be out by the beginning of April. That’s all I got! Cheers!